Visit 3 historic tapas bars of old Madrid. That you feel like a madrileño from Madrid, doing what the locals do. Our stroll starts at 12.30 or 7.00pm (depending on the tour option selected) at The Statue of the Bear and the Strawberry Tree (Puerta del Sol). From there we will go to our first stop. 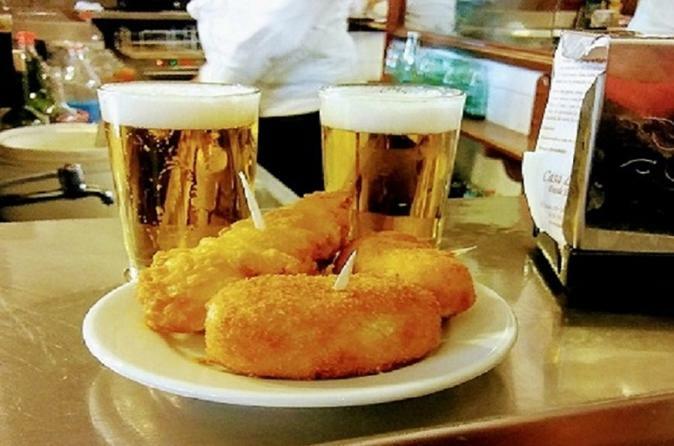 The first bar that we will visit has many anecdotes, opened in the 19th century by two Asturians, it has been witnessed the most important events in the history of the Spanish capital, in this tavern you will try their specialty that is very famous in Madrid and in all Spain. After trying their tapas and listening to the stories and anecdotes that happened there, you will go to the second stop. Crossing the Puerta del Sol towards House of Representatives or House of Commons, you will arrive at a very classic shop-restaurant in Madrid, founded in the 19th century by a French family; There, apart from trying their specialty and their drink, you will listen a lot of stories and characters that passed by. After this visit, you will go to the last stop of the tour, but before you will pass by iconic Madrid landmarks like the Puerta del Sol, Plaza Mayor, Plaza de la Villa (Old Town Hall) and the oldest restaurant in the world. The last stop is a tapas bar that was founded in 1867, there we can enjoy a fantastic vermouth or a glass of wine, between the smell of their wine jars, there we will also try some of their most representative tapas such as mussels, cockles, anchovies in vinegar and others tapas . PLEASE NOTE THAT THE ABOVE ITINERARY MAY BE SUBJECT TO CHANGE.